In my old house, there was a piece of duct tape covering a hole in the cracked glass window of the front door. I thought I was quite clever to tape up the draft but five years later, YES FIVE, I was replacing the tape and not the glass or the door. This was the sole entrance to our family home yet what was a little duct tape? Well, it was a metaphor for many things that were going on behind closed doors; both in the home and in my mind. The doorway is an amazing visual. It is both a transition point and a boundary. 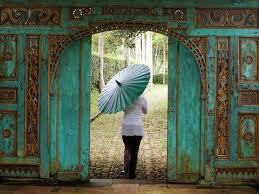 Doorways may represent a delicious opportunity……or closure to lessons learned and the drama of yesterday. You can choose if you want to hide behind a facade or grant access to your heart, your time and your future. Alexander Graham Bell said, “When one door closes another opens”. Notice he didn’t say stand there and regret or resent the past? Didn’t think so! Keep moving forward. Open your heart, the doorway to your authentic self, and experience what life presents. There is beauty in our struggles as well as in the lighter moments. Let life unfold. Every moment cannot be planned, controlled or anticipated. Grounded in gratitude, you can survive anything. Just keep moving forward….. I had to find my way to self-acceptance and self-love to get to the gratitude, which happened as a result of, in your words, “Open your heart… to your authentic self.” When you fall in love with your authentic self, moving forward becomes an adventure to anticipate, not an insurmountable mountain to climb. It might, however, take a little practice to get there if it’s a new way of thinking for you. It absolutely will become a happy habit over time, though. Thank you for your thoughts! In a way, loving yourself is a catalyst to removing obstacles or at least lowering barriers.